Went 2 the Bridge: Why Won't @SenAngusKing #MovetheMoney From "Defense" To Human Needs? Why Won't @SenAngusKing #MovetheMoney From "Defense" To Human Needs? 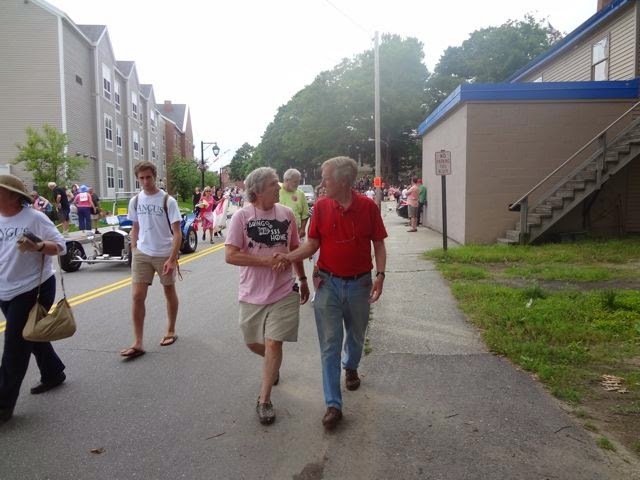 I got an email letter this week from Maine's newest senator, Angus King, seen here shaking hands with my husband near Bath Iron Works on the 4th of July, 2012. Mark is asking Angus, If elected will you support the campaign to bring our war dollars home and use them to meet social needs instead of enriching "defense" contractors? Angus replied that it sounded like a good idea. This is the standard line politicians seeking elected office give voters who voice the priorities that a majority in the U.S. hold. People consistently prefer spending on education, health care and veterans benefits to spending on bombs and wars, and politicians know it. When the U.S. kills and injures millions of innocent people and destroys countries around the globe it's all about jobs, see? Same story Rep. Chellie Pingree stuck to once she took her seat in Congress. Same story Rep. Mike Michaud hides behind as he runs for governor, and same story we hear from Sen. Susan Collins, darling of the "defense" and "intelligence" corporations. My friend Bruce Gagnon lives on the doorstep of Bath Iron Works and recently took delivery of a banner from the Union of Maine Visual Artists ARRT! team. 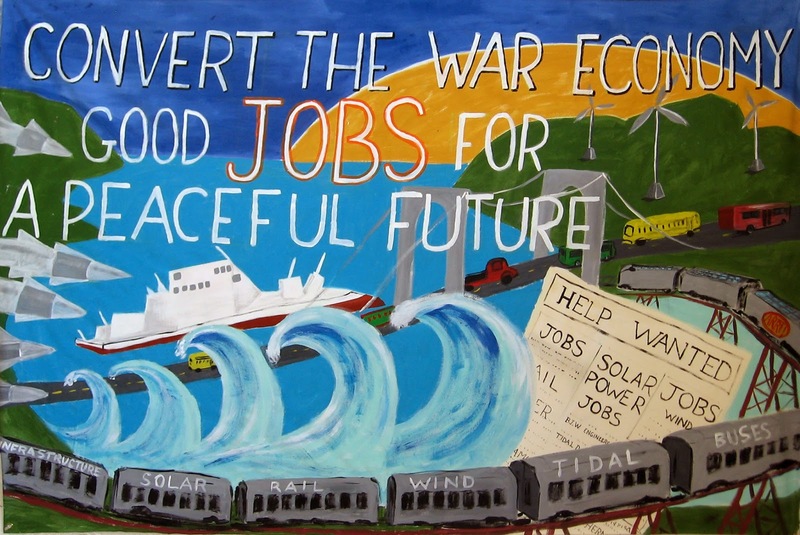 The banner was created for upcoming protests on April 12 at the launch of a new, super violent, super expensive type of weapon made in Bath for the profit of General Dynamics executives and shareholders. Based on past experience, I expect Angus King and Chellie Pingree and the rest will be in the limos that whisk VIPS through the gates at BIW at launch events. Even the former Secretary of "Defense" Robert Gates showed up once with Susan Collins. Maine is not unique in this regard. Jobs everywhere have been made to be dependent on the Pentagon's annual 50%+ share of federal spending. Are you sick of the spin that makes evil priorities seem like business as usual? You have two days remaining to enter a contest to create a shareable graphic comparing the cost of militarism to unmet human needs. 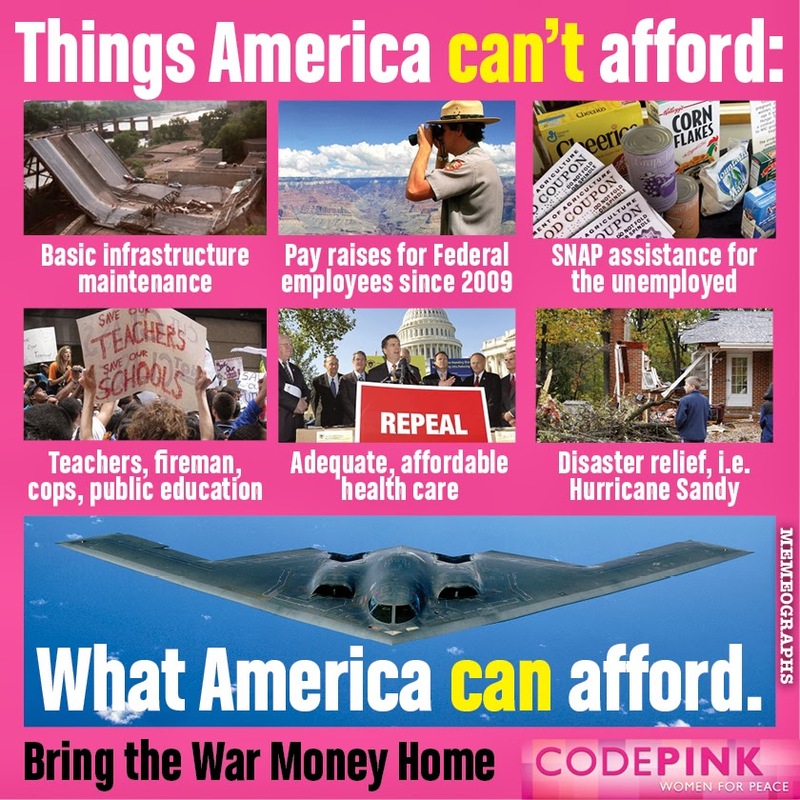 CODEPINK teamed up with the National Priorities Project to create this opportunity to turn federal budget facts into compelling visual story telling. The contest ends March 31. Details on how to enter are here. The winning images will be shared during the Global Day of Action on Military Spending, April 14, and on U.S. tax day, April 15.